Our Diaries Reveal Our Differences! I couldn’t help but share this with you! One of my dear acquaintances sent it to me and I think it perfectly demonstrates how we are different. As you read the story, imagine the wife as an “I/S” type and the husband as a “D” type! As you can see by this fun story – many times we have conflict that exists in our lives that doesn’t need to! We shouldn’t assume what someone else is thinking! If you want to learn more about personality types, check out our website:http://www.personalityprofiles.org. There are tons of great FREE resources to help you better understand and interact with people who are different from you! If you find this helpful, please share it on your social media! We love having help to spread the word about effectively communicating with others! Angel Tucker is an expert personality profiler who has been speaking professionally at venues across North America for over 27 years! Her dynamic presentations empower people with the ability to read personality types within 60 seconds! This valuable insight can give her audience the tools to succeed in self improvement, bettering relationships, effective parenting, and job advancement! As a C.H.B.C. (Certified Human Behavior Consultant) she has helped tens of thousands of people create win/win situations in every aspect of their lives! Her non-fiction book titled “Stop Squatting With Your Spurs On – the power to read people, get what you want, and communicate without pain became a National Best Seller the same month it was released. She is a valuable resource for media as an expert in her field and is regularly featured on National radio/television and internet venues as well as magazines. Angel is a highly sought after speaker who has worked with several well-known organizations to include Wal-Mart Women’s Council of Realtors, EXIT Realty, NADA, and the United States Air Force. Additionally, she has created an Award-Winning children’s book series called the “Four Pals” book series that teaches kids how to recognize different personality types and appreciate their differences. Did you know affirmations are a great way to start your day? I regularly help my coaching students develop affirmations that assist them in overcoming natural personality challenges. I’d like to share some of them with you today! I recommend writing them each one time each day for 21 days. You only need to do the ones for your personality type! If you want more affirmations for your personality, email me! I’m happy to give you some more: personalitypro@msn.com. I show kindness to everyone I interact with. I love to relax when my work is done! I put my family first. I always finish what I start! I am thankful for what I have! I invest and spend wisely! I enjoy getting tasks accomplished. I take good care of myself physically and mentally. I enjoy being a leader! I am confident and knowlegable. I make quick decisions effortlessly! I am great at persuading and motivating others! I am an excellent listener! I enjoy considering the ideas of others. I love to be spontaneous! I enjoy showing affection to others. Looking for a dynamic speaker for your next event? Contact Angel! personalitypro@msn.com. Angel Tucker is an expert personality profiler who has been speaking professionally at venues across North America for over 25 years! Her dynamic presentations empower people with the ability to read personality types within 60 seconds! This valuable insight can give her audience the tools to succeed in self improvement, bettering relationships, effective parenting, and job advancement! As a C.H.B.C. (Certified Human Behavior Consultant) she has helped tens of thousands of people create win/win situations in every aspect of their lives! 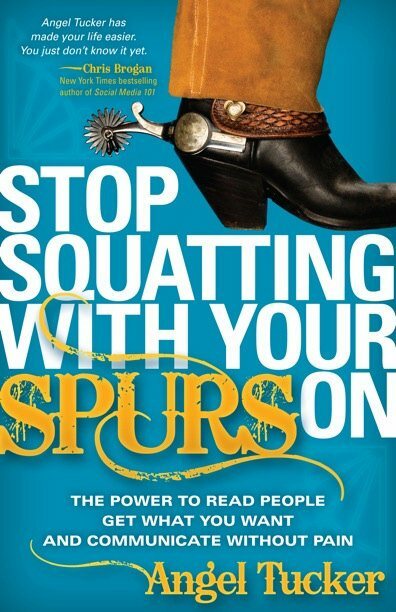 Her non-fiction book titled “Stop Squatting With Your Spurs On – the power to read people, get what you want, and communicate without pain became a National Best Seller the same month it was released. She is a valuable resource for media as an expert in her field and is regularly featured on National radio/television and internet venues as well as magazines. Angel is a highly sought after speaker who has worked with several well known organizations to include Wal-Mart and the United States Air Force. Additionally she has created an Award Winning children’s book series called the “Four Pals” book series that teaches kids how to recognize different personality types and appreciate their differences. Her latest writing credits include another children’s book and a collaborative effort with Authors such as Mark Victor Hansen, Jack Canfeld and Les Brown. To learn more about Angel or chat with her regarding the possibility of speaking at your next engagement, go to http://www.AngelTuckerAuthor.com and complete the “Contact Us” page.